This giveaway is now CLOSED. Thanks so much to our wonderful sponsor Marissa Del Rosario! We look forward to working with you again! The winner is Deb F. Remember: There are still some great giveaways active on the upper right hand side of the page! For Spring 2010, Ascending Butterfly has been hosting a special feature called 'Spring Into Bags' we are going to be reviewing and giving away hot handbags from 'IT' bag designers! Fasten your seatbelts fellow bag lovers you are in for an awesome ride! Can you believe we are already featuring the THIRD bag in the feature? Is it me, or is 2010 just flying by super fast? (In case you missed them, the first bag was by Elliot Lucca, it was a convertible leather crossbody in a 'poppy' color, and the second bag was by Linea Pelle, it was also a leather convertible clutch in a very spring 'kelly green' color). This time around I had the opportunity to ask the designer, Marissa Del Rosario, questions about the line, her inspirations and her life! Q. How long have you been a handbag designer? A. My DBA was started in 2007 but I did not really start designing until 2008. That would put me on a 2-year group but I have taken some classes in apparel designing in 2001. I've been designing ever since. Q. What did you do before designing bags? A. I worked as operating room nurse and still am. I had a bout of career burn out and thought this would be a great time to do a 180 (degree) turn by doing something that I'd always wanted to do: design. Q. What were the biggest obstacles you had to surmount when you launched your first collection? A. Everything. But that did not faze me because I have this strong passion for creating & designing that I was willing to step outside my comfort zone. From finding the right manufacturers (I've searched in N.Y. & L.A.; overseas is out of the question), leather vendors, pattern makers to meeting people to network with and learning to 'photoshop' my handbags were all a big adventure. Q. What will be big this spring? A. I see a lot of black & whites, army greens, and tribal and/or ethnic colors, both in jewelries, clothes and accessories. This trend is influenced, I think, to our current economic climate. I'd call this our 'let's get back to basics' response--colors of black & white, greens (nature), and tribal colors (again, earth tones of browns, greens, greys). Q. What inspired the Zip Line? Q. 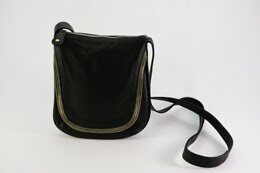 Looking ahead, what are the trends for Fall 2010 bags in terms of shape and color? A. There is definitely a move towards structured bags. 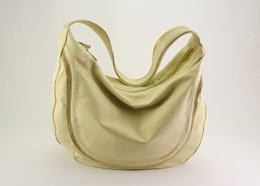 But it's a tough act to give up soft, conforming, unstructured handbags. They are here to stay. Women are also into big bags with lots of pockets, multi-length handles, and versatile designs (one that can be used for day and evening). Q. What retail locations carry Marissa Designs? A. I've changed my brand name to Marissa Del Rosario. Although my company is still in its infancy, my collection is already in a N.Y. showroom and is in a few stores in California. Q. Will you be solely focusing on bags, or do you intend to pursue other accessories such as jewelry, sunglasses etc? I am eternally grateful to Marissa for not only the opportunity to review & giveaway a bag from her line, but for the time and consideration of our Q&A Session. It's not very often you get the chance to look behind the designs straight to the person behind the brand. I find it amazing that Marissa is an Operating Room Nurse that is also pursuing her creative desires via design. Maybe I can relate because for many years I was seriously pursuing becoming a Cardiologist! So to all my butterflies who think switching gears in this economy is virtually impossible, here is a designer who is proving to you it can be done! Marissa is a designer to watch! Now back to the bag at hand (no pun intended!). I have been 'field testing' the Somerset Hobo in 'cherry red', and I absolutely love it. Somehow it feels like a bag I have always had, it's roomy without being oversized, and the multi color in the zip detail is a true stand out, it runs along the front and handle of the bag. It's very much on trend with the 'rocker' inspired styles I saw on the runway this Spring. It manages to be trendy while not being overdone so you can carry it with you throughout more than one season! Ƹ̵̡Ӝ̵̨̄Ʒ - Triple zipper detail in front only (silver/gold/silver) - Truly unique, allows you to wear either/or when it comes to your jewelry! Ƹ̵̡Ӝ̵̨̄Ʒ - East west zipper closure - It's very well done on this bag, eye catching but not overdone. It's do-able in the day which I can't say about all the 'rocker' style inspired bags. WIN IT! - Ascending Butterfly and our friends at Marissa Del Rosario would like to provide one lucky winner with the opportunity to have a Marissa Del Rosario 'Sierra Cross Body' bag in the 'Latte Beige' color from her 2010 Collection! (This is a $196 retail value!) - Don't you just ♥ Marissa Del Rosario? How to Win: (1) You must be a PUBLIC follower of Ascending Butterfly to be eligible for this and all giveaways. Indicate in your entry that you follow (if your 'comment name/user id' differs from your profile id, please let me know what name you follow under) and (2) Visit Marissa Del Rosario and Tell us what other bag ASIDE from the Somerset Hobo and the Sierra Crossbody that catches your eye and leave the LINK to that bag in your comment entry! (3) You must also leave your email address somewhere in your comment. (You can format it this way for security, example: ascendingbutterfly AT mail host DOT com, If it is visible in your profile, just say so, that's OK!). Please follow the easy 1, 2, 3 steps to winning! This giveaway is open to USA residents who are 18 years of age or older. Leave a comment with the tweet’s url so you can get a valid entry (click on the time your tweet was sent to get the direct URL and then copy and paste it here). FTC Disclosure Info for this Giveaway: This is not a paid insertion. This is a non-compensated post and all opinions regarding the products are expressly my own experiences. I was provided product to review and the sponsors are also fulfilling product to prize winner(s), this in no way influenced my opinion of my experiences with this product. Melrose Day bag in Turquoise! I like the Soho Satchel. Follow publicly...I love the Rhodes Tote in Azure Blue. I really like the Madison Baguette in black!! I am already subscribed to your blog via email! I'm loving her Madison Baguette in gold. So pretty! I really like the Melrose Day bags - all colors! I luv the Rhodes Tote in Azure Blue! I follow. I like the Soho Satchel in Cherry Red. I follow and the Melrose Day Bag in pearl pewter is gorgeous! My address is in my profile. fan of Marissa Del Rosario Designs on Facebook. Another bag I like is the Melrose Day bag in the Pearl Peweter color as it is very stylish and roomy enough for all my stuff. I became a FB fan of Marissa Del Rosario Designs on Facebook, and I posted on her wall that Ascending Butterfly sent me. I follow with google friend connect.I like this bag. Bristol Baguette in Cognac Brown. I "liked" your blog and left a comment. I voted for you #23! Good luck! I like the Melrose Day Bag the best. Follow @ Tracey Inglesias on Twitter. I love her Melrose Day Bag in pearl pewter! Thank you! I follow me @Tracy_Iglesias on Twitter. I Follow @MarissaDRosario on Twitter. I publicly follow you on GFC. Another bag that caught my attention is the Soho Satchel. To be honest, it caught my eyes because it was red, lol. I follow and love the Cherry Red Soho Satchel-so cool! I publicly follow your blog as Shilo Beedy and love the Rhodes Tote in blue. I follow @Tracy_Iglesias on Twitter as samsakara. I follow @MarissaDRosario on Twitter as samsakara. I follow publicly as Cindy H.
my fave bag is the Soho Satchel in black!